December 3, 2013. Sorry did I say netball? I meant foot… no, no, netball. That’s right. CAC coaches Sophie Legros, Nora Dooley, Sarah Brown, and CIC Homkant Surandase from Slum Soccer, stepped off the football pitch and onto the netball court for two weeks working with NAZ GOAL (nerd-alert! not be confused with the hobbit-hunting ring-wraiths in Tolkein’s classic). These two trainings in India were spent in Mumbai and then Delhi with two great groups of young leaders having a real impact on their communities. 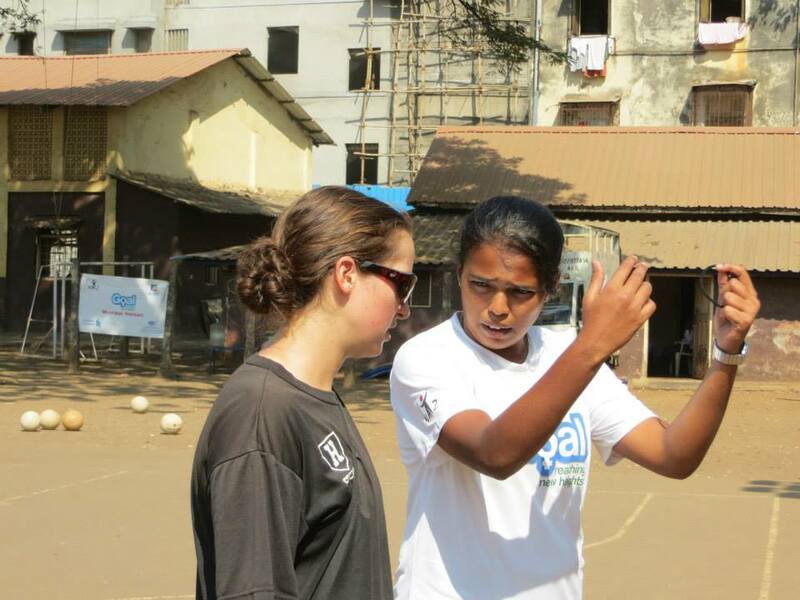 Our first week in Mumbai stands as the second year we have sent coaches to work with this team from NAZ. Our staff were very impressed by the manner in which this group presented themselves to us – who they are, what they currently do, what they want to do, and what they need from our team to make the most of our time in Mumbai and to have the greatest possible impact on the communities they work in. The communication was refreshing and the week kicked off – or should I say passed off? – to a great start. The participants consisted partly of peer leaders from the GOAL program. These are young female GOAL participants that are emerging as leaders among their peers and are pursuing the opportunity to play a more active role in their community. The rest of the group was made up of Community Sports Coaches (CSCs) and Senior Coaches. The CSCs are girls who have developed from peer leaders into coaches, and the Senior Coaches are young women – and one man! 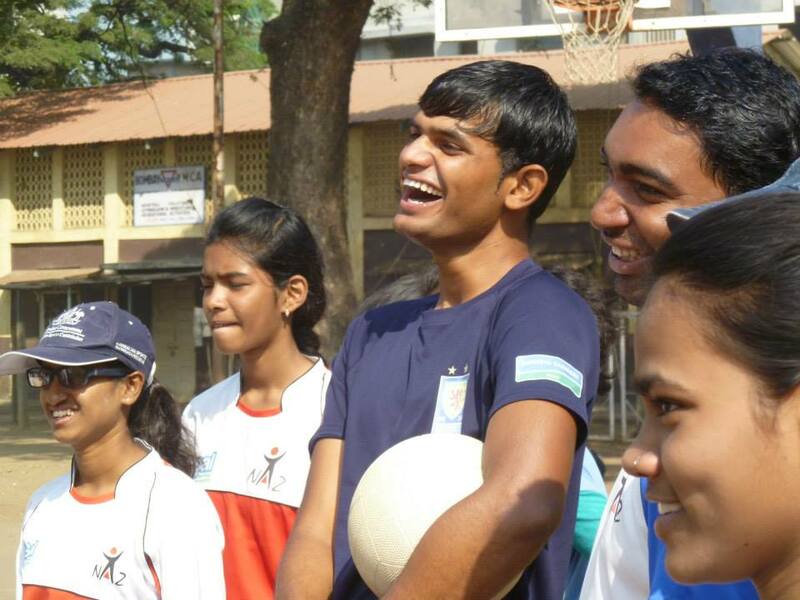 – who have come into their own as role models to the others, leading all things NAZ GOAL throughout Mumbai and beyond. The priority for this week, as communicated to us by the NAZ senior leaders, was for us to go through each GOAL game thoroughly to ensure that all participants understand how the game connects with the social message, and how to balance the dynamic between GOAL games and GOAL classroom activities. To assist in this effort we asked to be taken to a GOAL classroom session at a school so we, CAC, could better understand that aspect of the program. Our team started the day off by coaching the GOAL participants, a large group of giggly young girls, in one of our Be Money Savvy games called Budgeting with Yelena. This is a game of tag where the taggers represent things we should not be spending our money on, or “wants”, and we ask the players to come up with examples. This group thought of makeup, fast food, parties, and jewelry to begin the game. We play the first round where the “wants” chase everybody else and if they tag somebody they give them the cone and that person becomes the “want”. Then we add netballs. The netballs represent money. If a player has a ball she is safe and they must pass to each other to keep each other safe from the “wants”. But, if they drop a ball, or it goes out of bounds, they’ve lost the ball, the money. The players are forced to make smart, quick decisions to stay away from the “wants” and not lose their money. In life we must make good decisions and not spend our budget on the things we want but the things we need. We ask the girls after the game about “needs” and to give us examples of things in life that we need. This game corresponds with the classroom session “Wants and Needs” that we observed afterwards led by some of the CSCs. This activity expands on the differences between the things we want and those that we need, giving more examples, as well as giving the participants a sample budget and asking them how they would spend it. 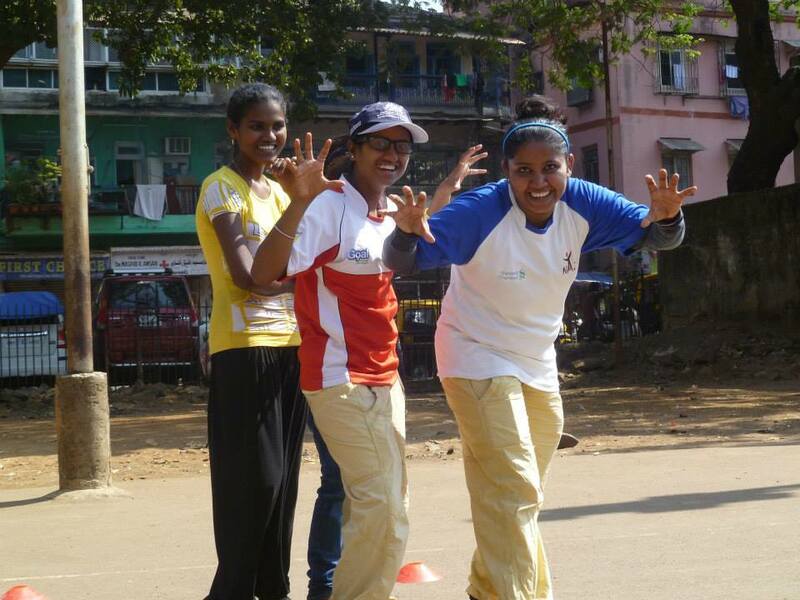 After this day we really understood what the NAZ Mumbai team needed and how we could best help them. The rest of the week was terrific and both groups left feeling satisfied that we accomplished our goals, enabling each other to do our jobs and achieve maximum impact. As we bid farewell to the heat of Mumbai, the wonderful YMCA where we stayed, and that incredible group of game-changers, we set our sights on Delhi, and prepared for the sensory overload that comes with the capital city. Same organization. Same country. That’s about all that was similar between our two weeks with NAZ GOAL. Delhi was a different state, different city, different group of participants, and a vastly different week overall. And that’s the beauty of Coaches Across Continents. Initially the program was to be the same with both groups, as we had previously planned with Senior Coaches from both cities. But just as we discover with every program, in every city/town/village, in every country we work in, plans change, adapt, transform as we begin to understand who we are working with, the dynamics of the group, the unique situation they are coming from, working in, striving for. It is all part of that magical CAC equation that yields success worldwide. 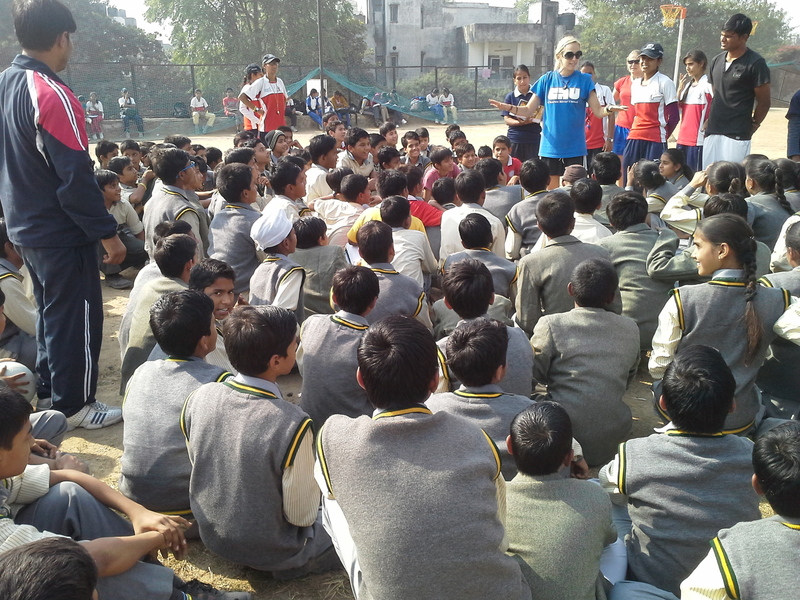 NAZ GOAL Delhi is where NAZ began in India, and it was obvious from the outset that this program was farther along in terms of organizational structure, management and sheer size. A larger group of participants, made up mostly of peer leaders and CSCs, the priority for this group was for the younger members to step up as coaches and practice their leadership skills. Built in to the week were two of the regularly planned GOAL sessions where peer leaders and coaches run games and classroom activities for about 150 students from the school where we were working. The plan for these sessions was for the GOAL team to assist the CAC team with one game, and then run the second on their own. Our team decided to play Mia Hamm Communication in one massive circle with 150 screaming, hormonal teenagers. Good idea? Great idea! Chaos ensued, naturally, but who doesn’t love a bit of mayhem at the office? The students went absolutely nuts, especially the boys, but they were so happy, so excited to play, so eager to learn and listen to every single word we had to say, and spoke great English so we actually managed to get bits of the social message across – wow! That was a ton of fun. The young leaders were great all week. At each and every session they could not wait to play, learn netball skills (from our CAC master netball coaches, of course), and participate in discussions about everything from the importance of budgeting and saving money, to keeping our bodies healthy and how important it is for women to empower each other, for men to empower women, and for women to empower men. Another great week with NAZ GOAL, a long blog, and our last stop in India as we say bye to CIC Homkant and coaches Sophie, Nora, and Sarah finish up long trips on the field for one last program in the beautiful mountains of Nepal – jealous? Yep.